Yes, that was how I felt too several years back, as I followed Nila on her journey to visit one of the many community libraries she set up in remote areas in eastern Indonesia. She named them “Taman Bacaan Pelangi” or in English, Rainbow Reading Garden. I was stunned. Touched by some sense of happiness that was deeper that what I had usually deemed it to be. We spent an hour or two in the library that day, before moving to another library spot in another village. We, who lived in the cities and take all these technologies for granted, do not often realise how fortunate we are. Those children have little access to the information beyond what they see or hear in their village. For them, that simple, thin colourful storybook is literally their window to the world. They too, of course, are blessed with the simplicity of life, awesome, wise nature, and close-knitted communities. Things that we long for. So I guess we both can learn from each other. We both can share what we have with the other. Such an enriching experience. I first visited Taman Bacaan Pelangi three years ago. I have been hearing about it from Nila long before that. But it was not until I actually visited it that I started to get what it was really about. 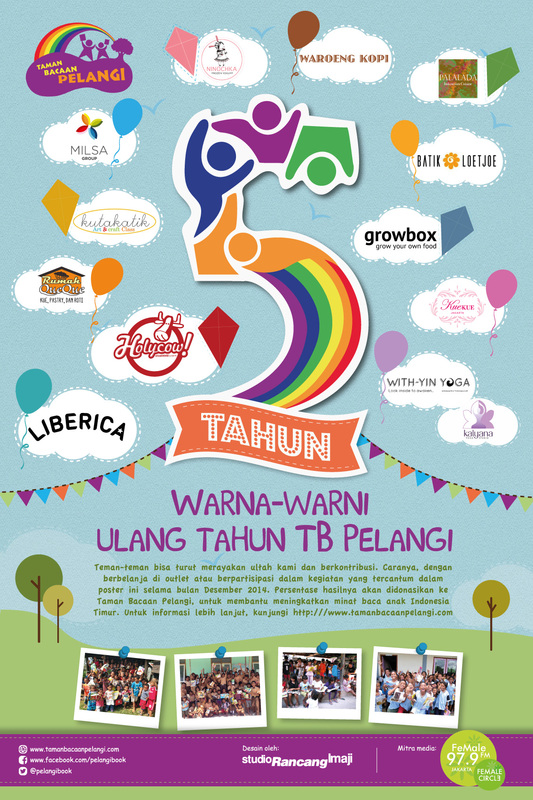 Today, Taman Bacaan Pelangi is celebrating its fifth anniversary. 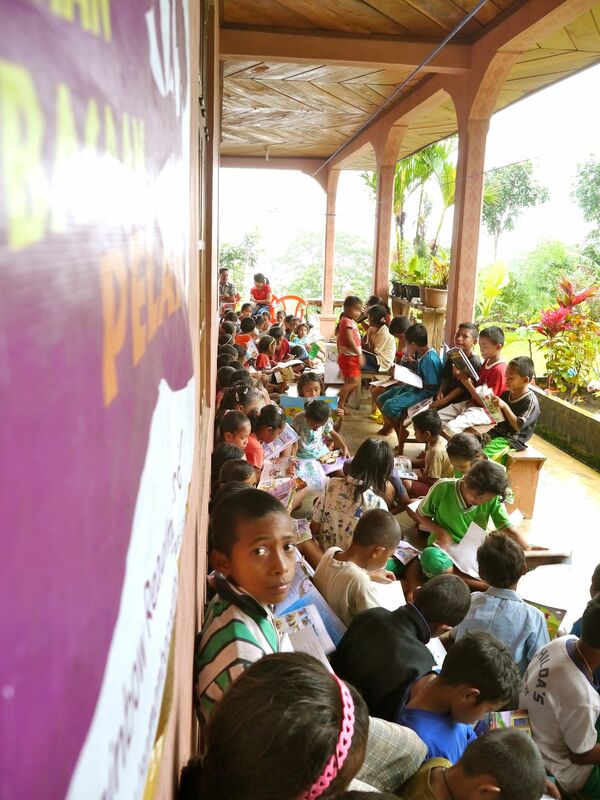 From one library in Roe village (library here means one wooden bookshelf and several hundreds children storybooks in somebody’s porch), it has grown to 29 libraries in 14 islands in Indonesia. May it continue to grow. May its beautiful intention touch our heart and invite us to grow as human being. May it benefits those who matter most in this case, the children of east Indonesia. For the love of books. For the love of children. For the love of Indonesia. For the love of our beautiful heart. Happy birthday.